Wanderlust is the story of Audrey Driscoll. Orphaned young, Audrey has grown up caring for her eccentric millionaire grandfather and her demanding younger sister, Annabelle, who assume she will always be there for them. Sheltered yet restless, responsible beyond her years yet hungering for experience, Audrey is hopelessly bound until she herself makes the daring decision to leave. As the 1930s unfold, alone, camera in hand, she will shock friends and outrage family as she plunges headlong into the wider world. Crossing the Atlantic aboard the luxurious Queen Mary, Audrey meets James and Violet Hawthorne, who will draw her into a sophisticated circle of artists and expatriates. And it is they who will introduce her to Charles Parker-Scott, in who Audrey will come to recognize a twin soul, a man propelled by relentless curiosity and driven by conflicting needs for intimacy and independence. Together they will spend an exquisite summer at Cap d’Antibes, then board the Orient Express on an adventure that will carry them to a remote outpost in China. But at the farthest reaches of this journey Aubrey must choose again. Japan has attacked China. Charles knows he must return to Europe at once. But Audrey becomes involved with a besieged orphanage and decides to remain in China without Charles, caring for the abandoned children until help arrives. In time Audrey will return to America with a daughter of her own. While she must come home to San Francisco to confront a world irrevocably changed by time, she finds she cannot stay. From prewar Germany to London during the Blitz, from a wrenching reunion with Charles to a war zone in North Africa, again and again she must choose between the dictates of her conscience and the yearnings of her heart. For Audrey Driscoll and the men and women whose lives touch hers, wanderlust is the inescapable element. Born at a time when women were expected to stay close to home and fulfill traditional roles, Audrey is compelled to follow the thread of events that will destroy the complacency of the past and shape the future. From Europe to China, from San Francisco to North Africa, she is irresistibly drawn into a man’s world of conflict, discovery, and danger. In a vivid novel of breathtaking scope, Danielle Steel has once again surpassed herself in creating an unforgettable tale of men and women caught in the tides of personal drama and historic event. 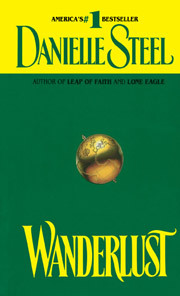 Wanderlust is Danielle Steel’s finest journey.